Here and now, down in that pit of jungled blackness were suddenly all the things he would never know or understand; all the things without names lived in the huddled tree shadow, in the odor of decay. Is the ravine real and deep and dark at night? It was, it is. I took my daughters there a few years back, fearful that the ravine might have gone shallow with time. 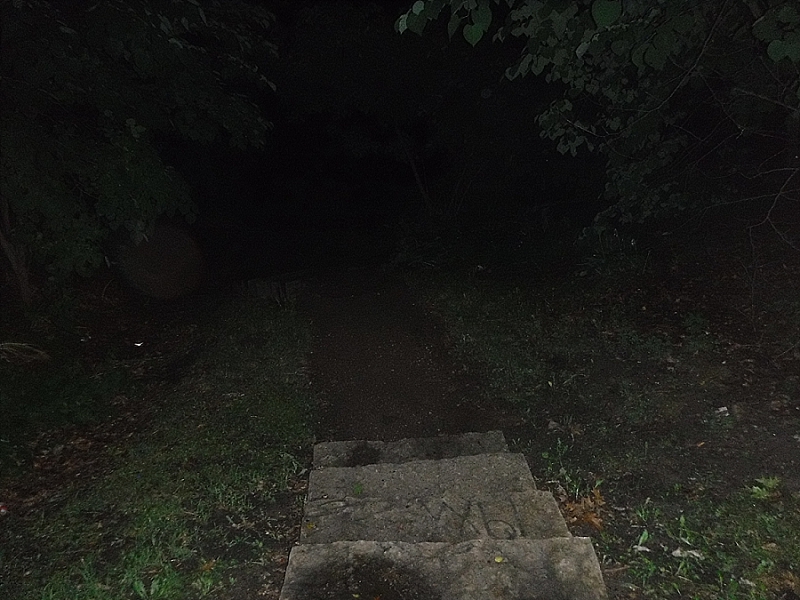 I am relieved and happy to report that the ravine is deeper, darker, and more mysterious than ever. I would not, even now, go home through there after seeing The Phantom of the Opera. September 26, 2016 — It was night, and the thunderstorm that followed me from the hotel had calmed into light rain and thunderous sky flashes. My hair was sodden, my shirt and jeans were sticking uncomfortably to me, and I was at the slippery edge of a black ravine, ready to disappear into its depths. All for Ray Bradbury. Back at the hotel, the kids were dry and tucked into bed and my wife was having a drink on the couch, waiting for the TV to come back on after being interrupted by the storm. We were all pretty beat. We had spent the morning in Chicago’s Field Museum, on a safari through dead animals and mummies and dinosaur skeletons. We had seen the serial killer lions of Tsavo, stood under Sue the T. Rex, and walked through the tomb of Unis-Ankh. Then we had driven an hour north to Waukegan, Illinois, the next point on our road trip throughout the Great Lakes. 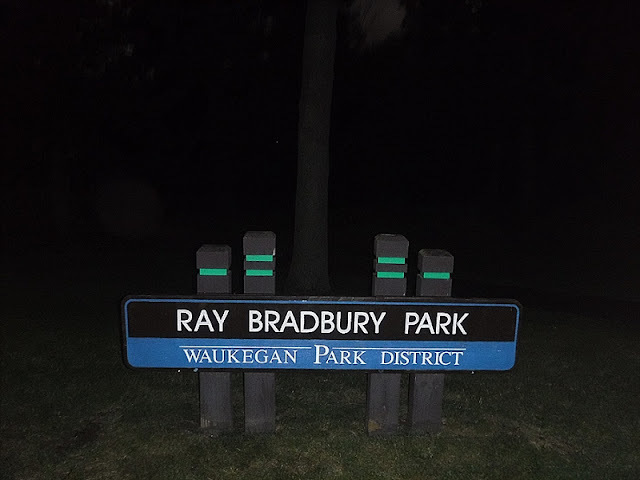 Waukegan was on our itinerary because of author Ray Bradbury, an obsession of both mine and Lindsey’s. He was born there on the western shores of Lake Michigan in 1920, and had spent the first 13 years of his life, on and off, there. The rest of his life was spent in Los Angeles, but it was Waukegan that inspired most of his stories. He fictionalized it as Green Town, Illinois, and then packed it full of his memories of carnivals and trains and movies and holidays. Dandelion Wine took place there. As did Something Wicked This Way Comes. Even when he didn’t name the town, like in The Halloween Tree, it was still usually Green Town. The next morning we were going to spend most of the day visiting Ray Bradbury-related sites in Waukegan. 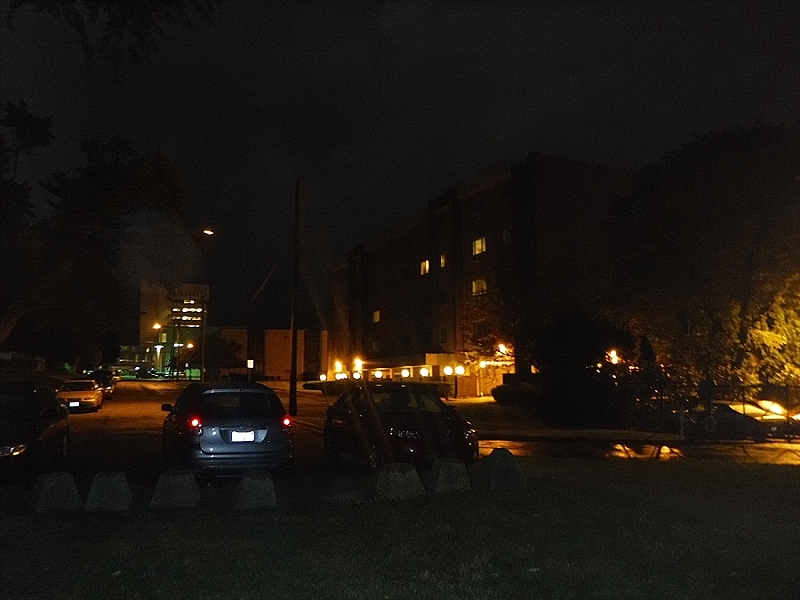 But I had to visit one particular site at night, and this was our only night in Waukegan, rainstorm be damned. I'm talking about The Ravine. The deep cut of creek featured prominently both in his stories and in his life, and Bradbury always described it as a mysterious, spooky thing. So I had to see it at night. The ravine was a few miles from the hotel, but I wasn’t able to take in much of the town since I was driving through an aquarium, with sheets of water making my windshield wavy and opaque. Finally, I pulled into the residential neighborhood on N. Park Avenue, where the entrance to the park is that holds the ravine. As I parked my car on the street, my headlights caught the flash of a Neighborhood Watch sign with its cartoony bad guy. I fiddled with the camera to make sure the flash was on, and then I pulled up the flashlight app on my phone. I waited a few minutes for the rain to slacken, and then got out of my car to stare into the utter darkness that was the park. The park has been around since 1891, but in 1990, they renamed the park after him. He was there for the re-christening. The press photos from the day showed him standing right behind the low wooden sign. I wondered not for the first time if it was that important for me to see the ravine at night. That I’d have all the experience I’d need with it tomorrow morning. But then I remembered the costumed boys who crossed this ravine at night to find Carapace Clavicle Moundshroud, the titular Halloween Tree, and Pipkin’s ghost. I remembered the Lonely One haunting there in the night in Dandelion Wine and the discovery of the body of Elizabeth Ramsell. 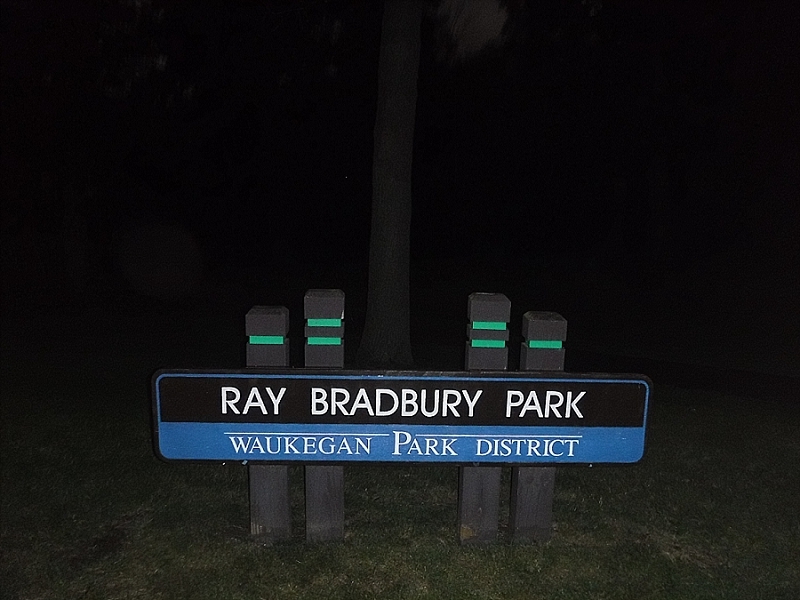 In both books, Bradbury introduced the ravine with initial caps and on their own line: The Ravine. In real life, boy Bradbury would cross this ravine to get into town, and then return here at night after watching horror movies like The Hunchback of Notre Dame and Phantom of the Opera at the local theaters, willing himself to continue even though he knew that his older brother Skip had run ahead and was waiting down there to scare him. I had to visit The Ravine at night. I knew that there were a couple of informational plaques somewhere in the park, but I saved finding them for the light of the next day. I took the steps down into the darkness. I couldn’t see what was down in the ravine. Maybe it was Pipkin holding for dear life onto his jack-o-lantern. Actually it was July, not October, so it would have to be the Lonely One, the serial killer in the story who Bradbury said was based on a real-life murderer. I couldn’t even hear the water from the stream below because of the rain, a rain that did very little to dispel the summer heat. I walked through a Christmas pageant of flickering lightning bugs, and a Halloween party of vampire mosquitos. 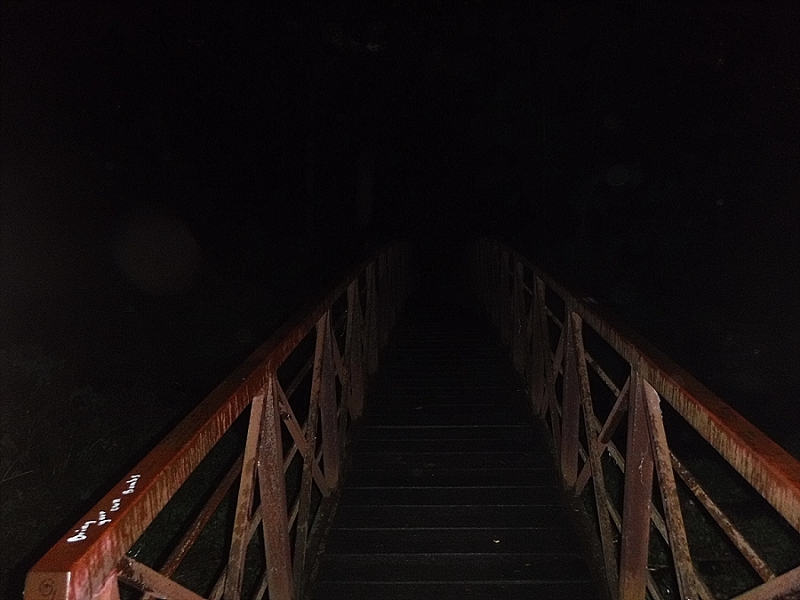 I flashed the camera so that I could see the bridge vaguely at the bottom connecting the shores of the stream: red metal railings and wooden planks stretching over blackness. 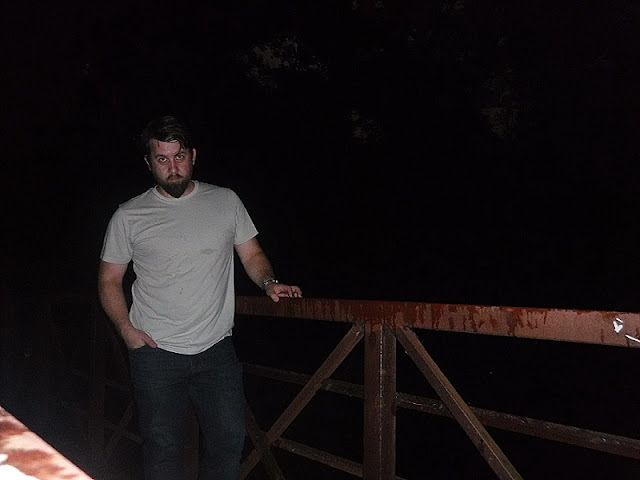 I took the steps slowly, since they were wet, and I soon found myself in a small wilderness…on a bridge…at night…in the rain…in a town I’d never visited. I wondered if I should have been more scared. Like, was this a bad part of Waukegan? How badly was I trespassing? Was I that guy in the neighborhood watch sign? Were there animals? The first thing we’d seen when we pulled into town earlier that day was a coyote running across the street and into a swathe of tall weeds. Were there coyotes here in the ravine? Should I even be afraid of coyotes? I had no idea. I walked to the other side of the bridge, my footsteps on the boards too loud to my ears. I felt like I was on a tightrope. Finally, in the soft grass of the opposite bank, the darkness became solid. 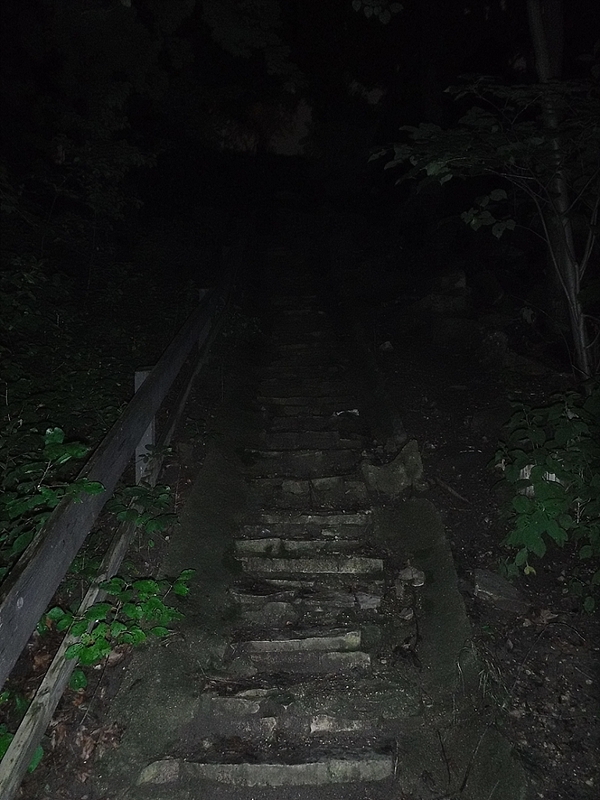 The next day, I would see a quaint wooden sign in that area calling the bridge and steps Dandelion Trail, but in the dark, I only had eyes for the presence looming over me. Here was the ravine’s steep side. The side I had descended was a gentle slope by comparison. There were stairs here, ancient stairs, vertiginous stairs—the same stairs Bradbury himself had ascended in anticipation and descended in terror. At the top, I barely made out a city glow. The steps coming down had been municipal, smooth concrete, well-spaced, and unremarkable. 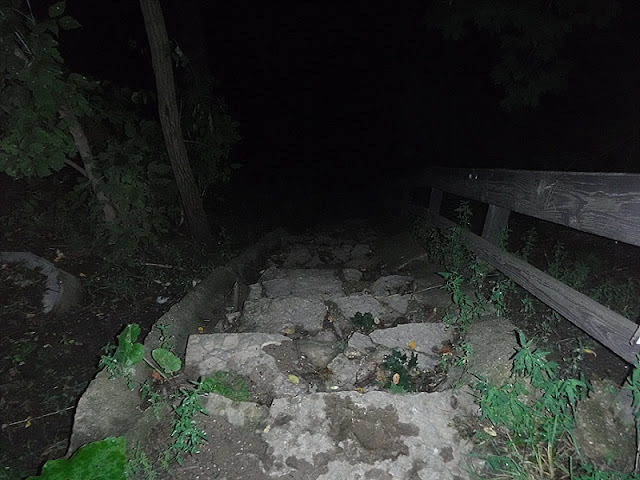 These steps looked cut out of the very hill itself and were in a state of decay so bad that they were no longer flat planes elevating to the top, but mere shards of rock sticking out of the side of the ravine, as if the stones had been smashed by somebody in iron boots. But they would take me out of the ravine. It was difficult going, especially in the rain, but in the end, I surfaced…to a boring parking lot and a boring cityscape. But I still had to return back through…The Ravine. Now I was a young Ray Bradbury after watching The Phantom of the Opera or The Bat or The Cat and the Canary and wondering if my older brother was down there waiting to scare me. Or if there was a masked organ player. Or Bela Lugosi. Or anything else. Going down the steps took a long time. As treacherous as they were going up, they were three times as bad going down. Breaking my neck at the bottom of Ray’s Ravine was not exactly on my itinerary, although it would have been a great way to piggyback on his legacy, I guess: "This place inspired Ray Bradbury…and was the death site of some dude that dug him," is what the tour guide would say. Finally, at the bridge, I stopped to take some photos of myself there. I felt less on a tightrope this time since I'd already crossed once without incident and took the chance to really looked into the darkness surrounding me. A hunk of concrete of uncertain purpose squatted at the bank of the stream. On the metal rails was a smatter of graffiti here and there, nothing elaborate, but I didn’t take the time to see if there were any Ray Bradbury references. The next day I’d find out there was none, just the usual juvenilia. I set the timer on the camera to take multiple shots and then balanced it precariously on the metal railing on one side, as I stood on the other, bedraggled but happy. I suddenly imagined the camera catching the Lonely One looming behind me, as I stared obliviously into the lens, not hearing his footsteps because of the rain. The feeling built until the spooks finally overtook me, and I high-tailed it out of Ray’s Ravine. But I returned to the hotel excited and triumphant and ready to see all the Ray Bradbury sites the next day. And I will never be able to read the passage below the same again. The boys lined up on the rim of darkness, looking down. And then Tom Skelton, cold in his bones, whistled his breath in his teeth like the wind blowing over the bedroom screen at night. He pointed. All looked. They saw his small shape race down the dirt path into on hundred million tons of night all crammed in that huge dark pit, that dank cellar, that deliciously frightening ravine.